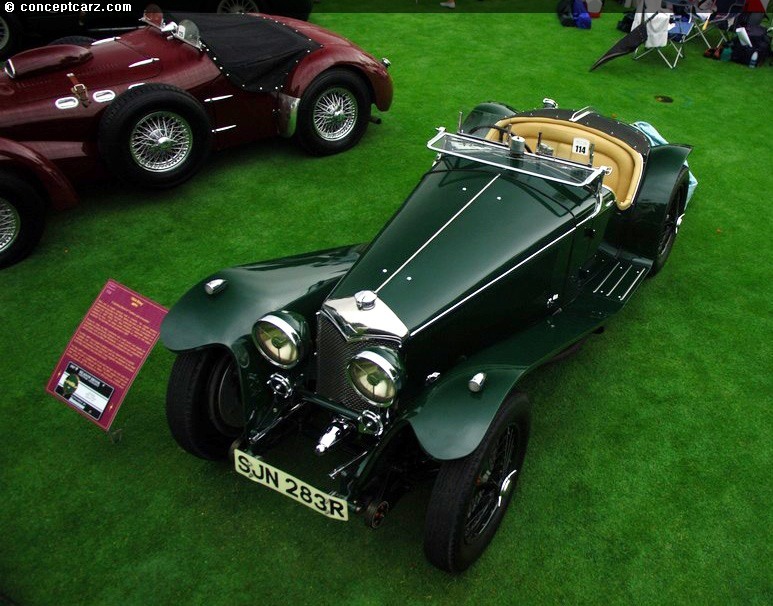 This was the 29th year of the Meadow Brook Concours d'Elegance honoring some of the greatest automobiles ever created. The theme was 'The Art That Moves Us', a celebration of the beauty and power of the automobile. The concours was staged on the lawn of the Meadow Brook Hall, considered by many to be one of America's castles and is the fourth largest residence in the country. The mansion has 100-rooms, 88,000 square feet of space, and impressive architectural details throughout. It provided a picturesque setting that aides in the appreciation of the automobile as a work of art and an evolution of mechanical prowess and cultural advancements. Alfa Romeo was the featured marque and given three of their own classes. In conjunction with the concours, the Alfa Romeo Owners Club (AROC) staged their national meet on the day prior to the concours, meaning their was no shortage of Alfa Romeo automobiles or enthusiasts. 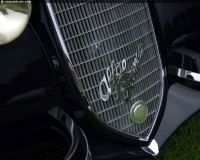 The AROC meet and the Meadow Brook Concours encompassed many historically important, rare, and impressive machines created by the Alfa Romeo marque. The concours also honored the work of coachbuilders Saoutchick and Murphy, the Class of '57, and mid-engined cars. Mother nature did all she could to help complicate things this year. Some of the cars that rolled off their enclosed trailers were recipients of a recent restoration, and their owners had to do the unbearable act of driving through gravel, mud, and rain. The thought of dirtying up the undercarriages made for a long day in the minds of some owners. It is probably the only time some of these vehicles will ever have rain on them. It adds a certain degree of 'art' to the vehicle, the way the rain drops roll off the body of the vehicle helps appreciate the vehicles line in a more visual way. Plus it puts the vehicle on another pedestal, one that is slightly lower, as these multi-million dollar vehicles get soaked. It does seem to rob the vehicles of some of its prestige and majesty, though it gave the visitors an opportunity to share in something that may never again happen to some of these vehicles. The rain hung around for only a short time and eventually gave up. When a major change occurs, one can usually expect negative repercussions or, at the least, a degradation of quality or the loss of key ingredients that make something special. Founder and chairman, Don Sommers, retired from his Meadow Brook duties last October, meaning change was on the horizon. Miraculously, the changes that occurred were for the better, with the same quality and well orchestrated activities occurring without a loss of pace. Part of the credit goes to a new list of sponsors, and the new Chairman, Larry Smith, who had been selected to take over the responsibilities. Smith certainly has the credentials which include concours judge, car collector, and committee member. Also new for this year was the over 30 historic motorcycles that shared the field with the over 230 automobiles, with histories that spanned over a century. It was very evident that the work of the 60+ volunteers and small group of full time staff really made big strides in creating entertainment and additional educational outlets for the younger generation to appreciate. The announcement of Best of Show should also be reinforced with reasons as to why it was chosen. Especially at Meadow Brook where there are so many potential contenders that could easily be given this prestigious title. What made the judges choose one car over another and how did they come to those conclusions? The judges at Meadowbrook are more than capable of selecting the best of the best; they are industry professionals, passionate car collectors, and enthusiastic individuals who have dedicated their lives to the automotive industry and its history. There were two Best of Show Award winners, an American built car and one for Europe. Both were deserving of the award for many reasons. Just before the announcement of the Best of Show winners, the People's Choice award was announced. This award is just as important as the Best of Show, since it is selected by the People and not the judges. The car is chosen for its allure, aesthetic beauty, styling, color, presentation, and appeal. This years People's Choice award was also the Best of Show European. So in all respects, it was selected by the Judges and the People as the Best in Show. It was also featured on the 2007 Meadow Brook Concours poster in a painting created by artist Ken Eberts. Best of Show European went to the Alfa Romeo 8C 2900B Corto, meaning short-wheelbase, Spider with coachwork by Touring. It had originally be commissioned for the Maharajah of Indore, and through the years has passed through several owners, and now resides in the care of Ray Scherr. To top things off, Alfa Romeo was the featured marque, so this honor is once again reinforced and appropriate. Best in Show American was the Chrysler CG Imperial with a coachwork body by Waterhouse. This car was also deserving of the award, as in its last few concours appearances at other events, it has secured itself the coveted Best of Show award. So not only did the judges at Meadow Brook feel it was deserving of the award, judges at other major concourses felt the same way. Last years Meadowbrook concours honored the Waterhouse Coachbuilding firm, and this Chrysler with its Waterhouse body was another example of Meadow Brooks tribute to the legendary, though some-what forgotten, coachbuilder. Intentional or not, there was no shortage of horsepower. Sitting on the hill overlooking the concours field was the pre-WWI Blitzen-Benz with a massive 21.5-liter engine that propelled the very narrow vehicle to many records in Germany, Belgium, and at Brooklands in England. The engine alone weighs over 400kgs! The Bugatti Royale, one of the world's greatest cars, has a length of 21-feet and weighs over 7,000 pounds. It could make a Hummer H2 feel insecure. Mounted under the long bonnet is a straight-eight engine that displaces 12.7-liters and can create around 300 horsepower, not bad for a car created in 1931. The high-horsepower Duesenberg Model J's were in attendance, in both eight- and 12-cylinder form. Nearly all of the Model J's were powered by an eight-cylinder DOHC engine, except for one that was given a Lycoming 12-cylinder engine, more commonly found in an Auburn. There were several of the early 1930s Cadillac V16, along with the recent Cadillac Sixteen Concept, all of which sported sixteen cylinder engines. One of the surviving Chrysler Turbine's was in attendance and even made a trip to the judges stand to receive an award. As it rolled in front of the awaiting crowd, its turbine's engine were awakened and rewarded by clapping and cheering from the crowd. And of course, there was the American muscle, such as the Buick Riviera GS which is powered by a 425 cubic-inch 'Nailhead' V8 which offered over 350 horsepower. A rare Phase 1 Supercharged Ford Thunderbird is one of only 15 constructed of which 8 have survived. It has a NASCAR supercharged 312 cubic-inch V8 with a McCulloch VR57 supercharger and other upgrades and enhancements. As the pony-wars began to heat up during the late 1960's, Chrysler introduced their E-body car, which brought about the Dodge Challenger and the Plymouth Barracuda. The Performance 'Cuda version had its own Trans-Am version called the AAR, which stood for Dan Gurney's All American Racers. It came with the legendary 'Six Pack', a 3x2-barrel carb'ed version of the 340, a unique fiberglass 'shaker' hood and strobe stripes. The dramatic, bold, and exciting coachwork by European coachbuilder Jacques Saoutchik have adorned such famous luxury cars as Hispano-Suiza, Talbot-Lago, Pegaso, Duesenberg, Farman, Voisin, Minera, Delahaye, Cadillac, and Mercedes-Benz, among others. His talents were in high demand and his flamboyant and exotic creations served a wide range of duties, from show cars to transportation for the elite in society. On display at this years Meadow Brook Concours were a collection of Saoutchiks work, including the stunning Bucciali TAV-8-32 Sedan and eye-catching Cadillac Series 62. The judges chose the Bucciali, the star at the 1932 Paris Auto Show, as the most deserving example of 'Best in Class' in the 'Custom Coachbuilders Saoutchik and Murphy' category. Walter Montgomery Murphy established a coachbuilding company in Pasadena, California in 1920 which quickly became one of the more prominent in the country. During the companies existence, lasting from 1920 through 1932, bodies were created for Bugatti, Bentley, Doble, Dorris, Duesenberg, Isotta-Fraschini, Lincoln, Minerva, Packard, Peerless, Pierce-Arrow, Rolls-Royce, Locomobile, and many other prominent marques. The list of clientele included industry giants, Hollywood stars, trend setters, and the country's wealthiest individuals who appreciated the simple and elegant lines of the Murphy bodies. Included in this years list of Murphy bodied vehicles at the Meadow Brook Concours included several stately Duesenberg automobiles and a V16 Cadillac. The mid-engine category was a group of cars that all had very similar appearances. All of them were exotics that had a low roofline, a snout that flowed from the ground upwards to the windshield and continued to its aerodynamic crest at the roofline, and flowed gracefully back down to the rear. These are some of the benefits of mid-engine placement, which generally has the engine mounted behind the cockpit and in front of the rear axle. Other benefits of this design are 50/50 weight distribution, where the weight of the vehicle is equally dispersed throughout. The mid-engine class at Meadow Brook included pre-1973 mid-engine cars that included the Ford GT40, Dino Ferrari, DeTomaso Mangusta, Chevrolet XP882, AMX AMX, Maserati Bora, and ATS 2500GT. The judges chose the short-lived ATS, created by six ex-Ferrari employees, as this years Best of Class. The Class of 1957 was a celebration of American automobiles from fifty years ago. Over ten examples were on display, including the iconic Chevy Bel Air, exclusive Imperial Crown Convertible and Cadillac Eldorado Biarritz, powerful Olds Super 88 and supercharged Ford Fairlane Skyliner, among others. Best in Class went to the DeSoto Adventurer Convertible with its dramatic black paint job and contrasting gold trim. Fewer than 2000 Adventurers were produced in 1957 with 300 being convertibles. The example on display was one of the finest examples of its kind in existence. The Meadow Brook Concours always conjures up thoughts of 'So many vehicles, so little time.' It is a one day concours for enjoying hundreds of automobiles and motorcycles that span so many decades, tell so many stories, and express so many different facets of style and art. The participating car clubs, RM Auctions, and many other activities that transpire throughout the week make this one of the greatest of its kind in existence.